Nelson Mandela has become a brand, “Brand Mandela,” his image, name and prison number used to generate cash and to promote the legend of Mandela. In July 2012, for example, the 46664 clothing line was launched (all “Made in China”). But “Brand Mandela” is more than just an opportunity to sell stupid trinkets to tourists and celebrities. It is also a dangerous myth, based on Mandela-worship, promoted daily in the public imagination to serve far more sinister interests. The myth of Mandela is used to give the vicious South African ruling class credibility by association, and to legitimise the the ruling African National Congress (ANC). 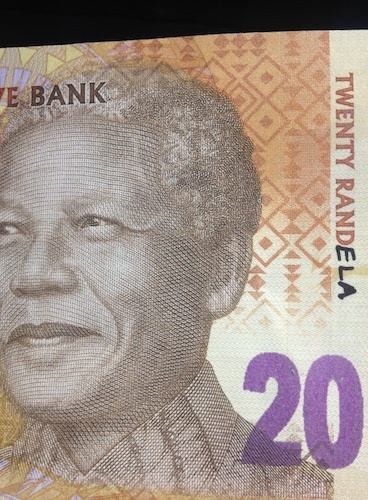 It is no surprise that the 2012 launch of the new “Randelas” – South Africa’s new set of banknotes, with Mandela on – coincided with the ANC’s national conference at Manguang. And this “Madiba money” came amidst a host of other devices of Mandela-worship. These include the unveiling in Bloemfontein, where the ANC was founded in 1912, of a new Mandela statue. According to state President and ANC head Jacob Zuma, this is a symbol of “reconciliation and tolerance,” and a reminder to “keep talking” about the national hero, and his “real story”. Criticising Brand Mandela in no way means we should spit on the sacrifices Mandela made during the anti-apartheid struggle, or his important role in the 1994 transition that enabled major gains in rights. But stirring up public emotion with liberation imagery, and using the image of Mandela as a living saint, has been a decoy to obscure the far less heroic story of the ANC in power, and the unpleasant realities of the Mangaung conference. Like any other nationalist propaganda, Brand Mandela has been a used by the rich and powerful to perpetuate a rotten class system – a system the ANC helps maintain through its neo-liberal policies, elite “empowerment” deals and police massacres. A system that has caused misery for the millions of poor South Africans Mandela is said to have “liberated”. In South Africa, this class system is run by an alliance of (mostly white) private capitalists and (mostly black) state managers who collude in their mutual class interests. Since our bloody history has ensured very little space exists for black hopefuls in the white-dominated private sector, the state has become the key means to access money and power. And finally, to set the record straight, Mandela was not the one-man author of the country’s liberation – even if he played an important role; he never claimed to be. For the advances made in 1994, the black working class majority and its allies of all races, have only themselves – their own collective strength and solidarity – to thank. If Zuma wants a “real story”, here it is.